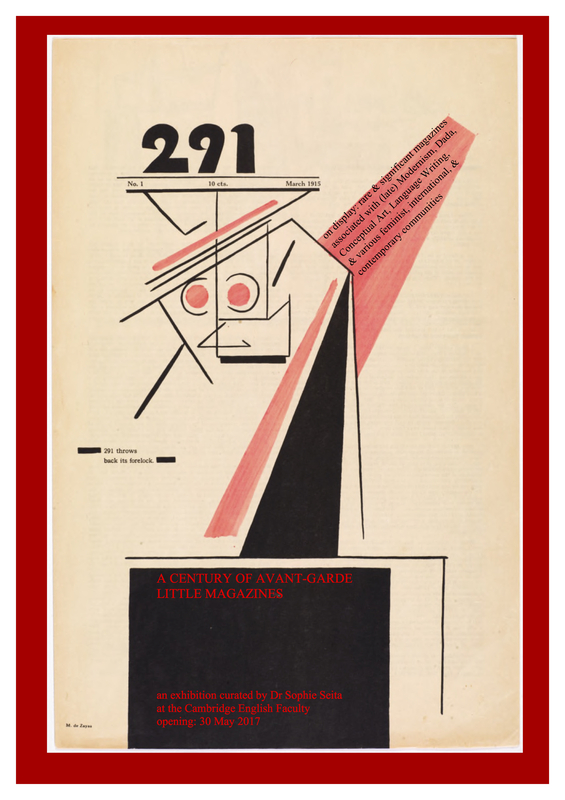 Currently on display in the Cambridge English Faculty exhibition space is a selection of some of the most fascinating, rare, important, and often forgotten avant-garde magazines from the early twentieth century all the way up to the present day. ‘A Century of Avant-Garde Little Magazines’ celebrates the crucial and multifarious contributions magazines have made not only to the development of an individual writer’s or artist’s oeuvre, but to numerous national and international avant-garde groupings, and to cultural, political, and aesthetic tendencies more broadly. The exhibition includes print magazines associated with Dada, Modernism, the British Poetry Revival, the mimeograph revolution, feminist and contemporary communities, and a digital display of materials published on the peripheries of Conceptual Art and Conceptual Poetry, Language Writing, Fluxus, and many other avant-gardes. Moving away from a focus on the individual author or the single work, the exhibition emphasises the material richness and collaborative spirit of experimental publications and publishing communities, drawing attention to their innovations in design, typography, and aesthetic form, and to the collective work of editors, practitioners, readers, and other, often invisible, participants. The items on display are on loan from the Cambridge University Library, English Faculty Library, and private collections, while the digital materials are photographs taken in a number of archives, from the Beinecke Library (Yale), Fales (NYU), Princeton, New York Public Library, to MoMA, among others. An introductory talk by Dr Sophie Seita, Junior Research Fellow at Queens’ College, will take place on Monday, 5 June, 3-4.30 in the Board Room of the Faculty of English.